Who are the parents II? I've always felt there were two obvious ones, but I put it to you, who are the parents? Thank you for making me feel lame for sucking at this, I cannot think of anyone!!!! Boy does that piss me off. Hmmmm....I'd say Lucy Van Pelt and Anthony Quinn. Alan Ruck and Shirley Maclaine. I could believe they have more influence on him that just genetics, too, as he's somewhat unorthodox. DAvid Lee Roth and Kathy Lee Gifford? 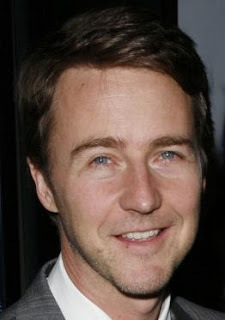 Edward Norton is my absolute favorite actor, btw. Kiefer Sutherland and Jennifer Aniston. Yeah, I know...but man - think about it! Father = Dana Carvey in Wayne's World. Bottom half of face is Mel Gibson. Top half is Ellen Pompeo. Im gonna go With Alan Ruck and Sarah Polly. Me and Mr. Hendrik. No doubt about it. I can't even guess so I will: Abe Vigoda and Brooke Shields.